Nancy Scirocco Nesbitt has joined United Personnel as its new Vice President of Business Development for the Connecticut region. Nancy, most recently Vice President for Government and Not-for-Profit Banking for Webster Bank, brings over 20 years of management, client support and economic development experience to her position with United. Past positions include Vice President of at the Metro Hartford Alliance, adjunct professor at Central Connecticut State University and Contract Administrator at Otis Elevator. Nancy has an MBA from Rensselaer Polytechnic Institute and a BA from the University of Connecticut. She serves on the Governor’s Task Force for Abused Children and is a former board member of Internhere.com and the Special Olympics, CT.
Brandon Houston, United Personnel’s new Director of Client Services, is leading the expansion of United Personnel’s Information Technology Division. Brandon has over 10 years of human resources experience, with a specialty in recruiting and placing software engineers, developers, architects, project managers, infrastructure and security personnel. He most recently worked as a Senior Account Manager for Prestige Staffing in Atlanta, Georgia; other prior positions include recruitment management roles at Latitude, Inc. and Maxim Healthcare. He holds his BA in political science from the University of Tennessee and is involved with the Metro Hartford Alliance and HYPE. 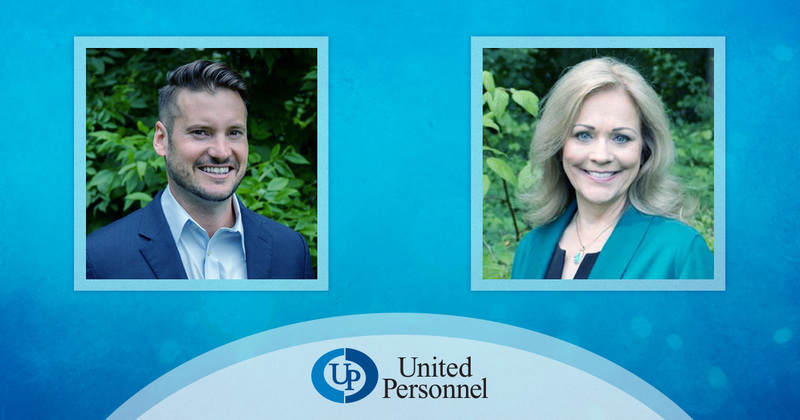 United Personnel’s president, Tricia Canavan, remarks, “United Personnel is excited about the opportunity to expand our human resources and recruiting services in the Connecticut marketplace. Nancy and Brandon will lead our innovation in recruitment and placement services, providing significant value to both our clients and candidates. About United Personnel: Founded in 1984 in Hartford, CT, United Personnel connects more than 1000 people with great jobs throughout Massachusetts and Connecticut each week. From temporary and contract work to direct hire placement, United provides clients with staffing solutions in a variety of industries and fields, including professional, administrative, medical, technology and light industrial placement and vendor-on-premise project management. A local, woman-owned business, United Personnel has received various awards throughout its history including: Champions of Hope from United Way of Pioneer Valley, Inner City 100 List by Initiative for a Competitive Inner City (ICIC), List of 500 Fastest-Growing Privately Held Companies in America by Inc. Magazine, Super 60/ Fabulous 50 Award by the Springfield Regional Chamber of Commerce and Top 100 Woman-Led Businesses in Massachusetts from Babson College and the Commonwealth Institute.